If it is called agriculture in Japan, it will be cultivation of a rice, vegetables, or fruit. It is difficult to take profit in agriculture at a small-scale farmhouse. Being engaged in agriculture is best for health. Moving the body moderately in nature and growing a plant can be refreshed for mind and body. Agricultural foundations are cultivation of rice, vegetables, and a fruit tree too. Construction of the warehouse for the mowing work and the agriculture of fields can be said to be auxiliary work required in order to carry out plantation agriculture. In order to carry out agriculture, it can do also in the knowledge learned from the book or the person, but unless it experiences by itself too, it does not work. I am pleased if what I experienced is consulted. 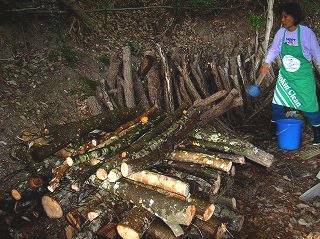 The tree with much the hard tree, tannin, and tar for shiitake mushroom is avoided, and generally uses the tree of broadleaf trees, such as a tree of a cherry tree and an oak, a Japanese oak, a walnut, a willow, and the Japanese oak. After planting a shiitake mushroom bacillus, material wood is put on the place which requires rain in the shade upon which moist direct rays do not shine. It accumulates on parallel crosses like a photograph. Water is poured fully after that. It will pass in about two years and will call the tree out of which a mushroom came to come a "Hodagi". A mushroom continues occurring for several years.